Recently, Harlan Rector had the idea to take his original L.I.G.H.T. radio dramas (40 true-life stories), turn them into a 10 CD audio-series, and try to get them into local prisons as a possible ministry for the inmates. A chance phone call to his friend, revealed that he already had an ongoing ministry at four prisons in Missouri. This was an answered prayer and now the L.I.G.H.T. audio-series is in the libraries of ALL twenty-three prisons in Missouri. Inmates can now check out a CD and listen to these inspirational stories the same way they would check out a book to read. The forty original L.I.G.H.T. stories/recordings have been re-edited and digitally re-mastered for exceptional audio quality. We have produced one hundred L.I.G.H.T. CD Albums not just for the Missouri prisons, but for future prisons as well. Now, the correctional facilities in the State of Florida have requested that we donate 54 albums for all their prisons. Connecticut has also been contacted, with 47 states to go. We are spreading God's word throughout our nations prison system to educate, inspire and lighten the hearts of the inmates through God's redeeming love. From the beginning, Harlan has personally underwritten most of the expense for L.I.G.H.T., including the development, audio engineering, production and distribution for this ministry without ever asking for anything in return, other than to be a good disciple, spreading God's word of love and redemption. Now, in order to produce L.I.G.H.T CD albums for almost eighteen hundred (1800) State and Federal Prisons across the country, we'd like to ask for your help. Our goal is to reach the 2,250,000 men and women in the U.S. prison system with God’s message of hope and redemption for their lives. To help accomplish this goal, we hope you will consider this opportunity to help us send L.I.G.H.T. to prisons in every state in America. A gift of $69 will place a L.I.G.H.T audio-series in 3 prison libraries. A gift of $99 will place a L.I.G.H.T audio-series in 5 prison libraries. To purchase this 10 CD Album of L.I.G.H.T. Stories for your Church, Organization, or for your own inspiration, please click on the PayPal link below. This CD set is available for only $99.95, which includes shipping and handling (US only). 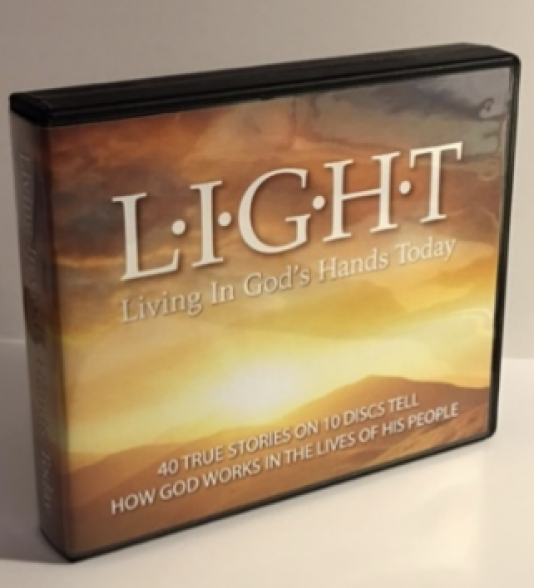 As a special, limited time introductory offer, we are offering this 10 CD Set of L.I.G.H.T. Stories for only $69.95! Order yours TODAY! It also makes the perfect gift! (All proceeds from sales and donations go to the production of more L.I.G.H.T. CD Albums to distribute to more correctional facilities and inspire more inmates with God's word of love and salvation).